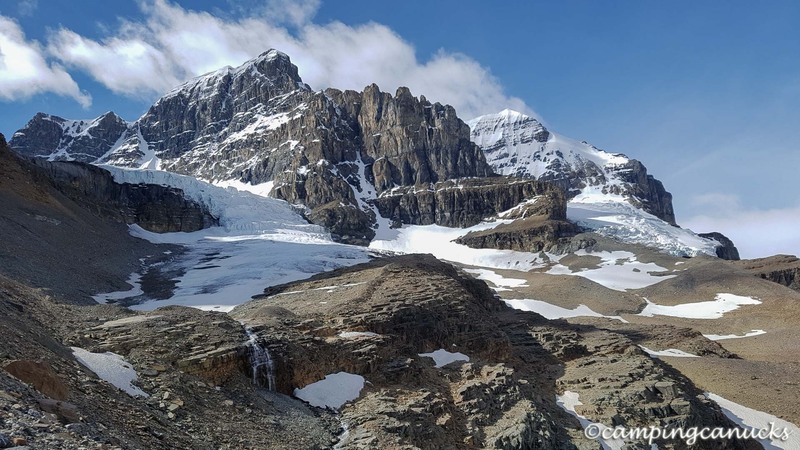 The plan to climb Mount Athabasca in Jasper National Park came about while we were out in the mountains along the Coquihalla Highway during the winter of 2016. That was the area Anthony and I went to several times over the winter to practice the various skills needed for mountaineering and climbing in the snow and we felt we were ready to tackle something bigger. As I knew someone who had been up Athabasca in the past, I made contact with him and we began to plan the trip for July 2016. 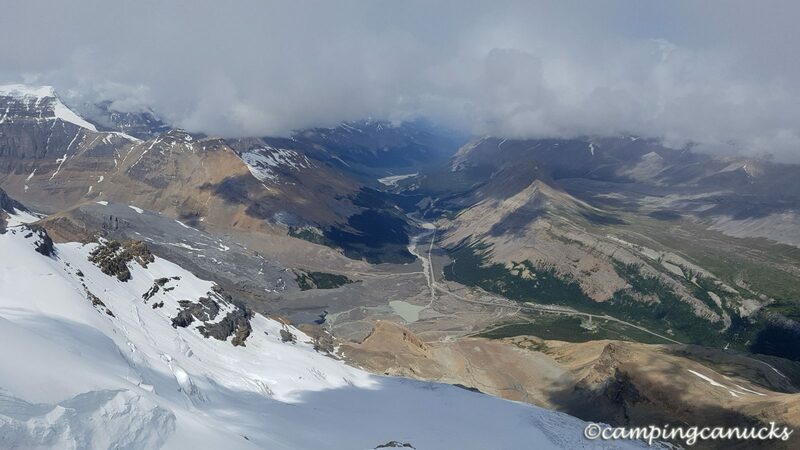 Due to his previous experience ascending Athabasca, we picked the first week of July and gave ourselves a three day window to climb to account for the weather. Initially we had figured on doing the Silverhorn route but when Richard was unable to make the trip, Anthony and I decided to take the ‘easiest’ way up via the AA Col Route. Arriving at the Wilcox Campground near the Columbia Icefields Centre on the Sunday afternoon prior to the climb did not inspire much confidence in us that the weather was going to be all that great. Occasionally we would be lucky enough to see the peak but much of the area was very socked in for much of that day and the next. It also rained quite a bit on the day we arrived and being how much colder it was up high, we knew it meant fresh snow up on the mountain. With no plan to climb on our second day at the icefields, we took it upon ourselves to do a recon trip a little ways and make sure we knew where the trail was at the base in order to save the time when we went for the peak. Unfortunately, Parks Canada has closed the climbers’ parking lot where anyone heading up to the peak was able to park, so we had to walk up the road from the parking lot near the highway. That meant nearly three extra kilometers each way which was a bit of a drag and would add extra time to an already long day. Of course, there were many buses coming and going so there was the constant smell of diesel along the road. It sort of detracted from the experience, to say the least. On the flip side, though, a lot of tourists seemed to like to take our pictures as they drove by us with our packs, rope, and gear, so we did our best to look like grizzled mountain veterans. Usually the buses would honk at us as well, so we’d wave and most everyone would wave back from behind their cameras. 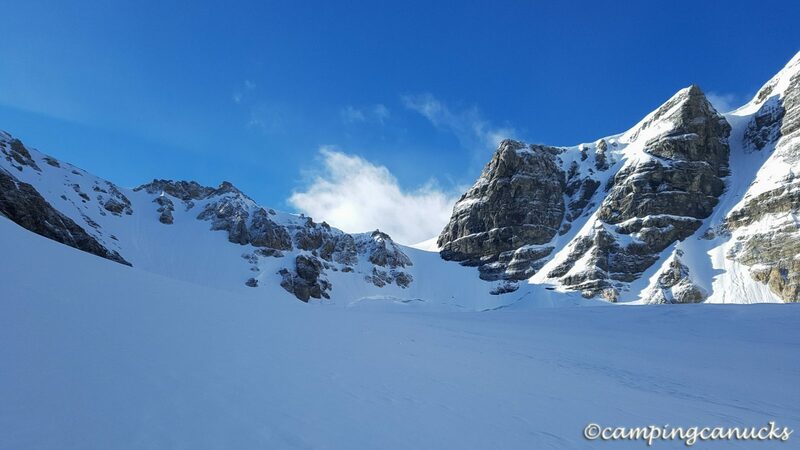 With fairly good weather for the early part of our short hike, we were able to get onto the first headwall leading to the AA Col for a bit of a look around. 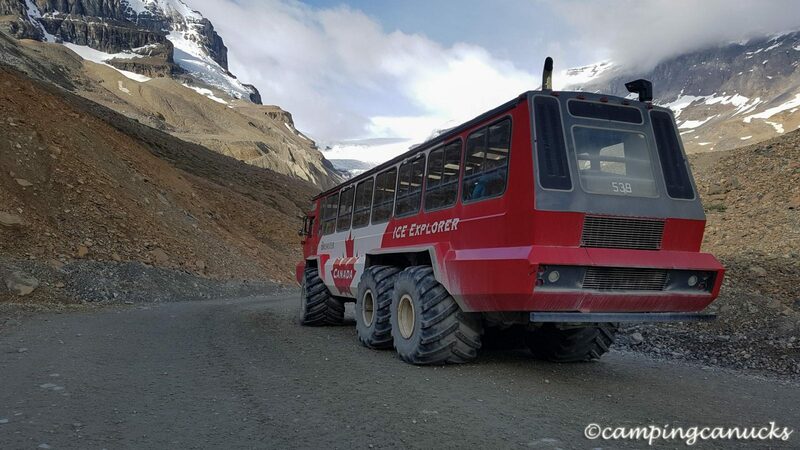 We could usually see several buses and lots of people milling around out on the glacier. We spent a bit of time scoping out the next part of the route before a sudden snowstorm blew in. 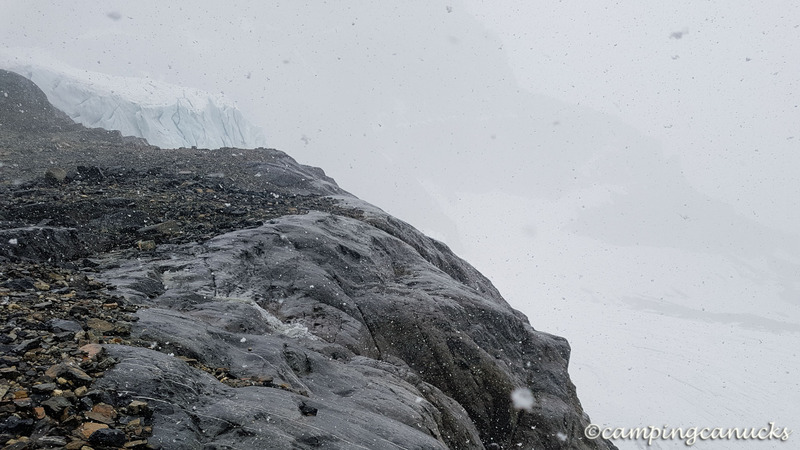 With visibility and the temperature dropping, we decided we would head back down to camp for the day. However, on our way down, we spotted someone walking on the Athabasca Glacier and disappearing into a shallow crevasse. From our vantage point, they appeared to be struggling to get out and it didn’t seem likely that anyone else out there had seen them go in. With that in mind, we hustled our way back down, fully expecting to have to rescue them from the crevasse. 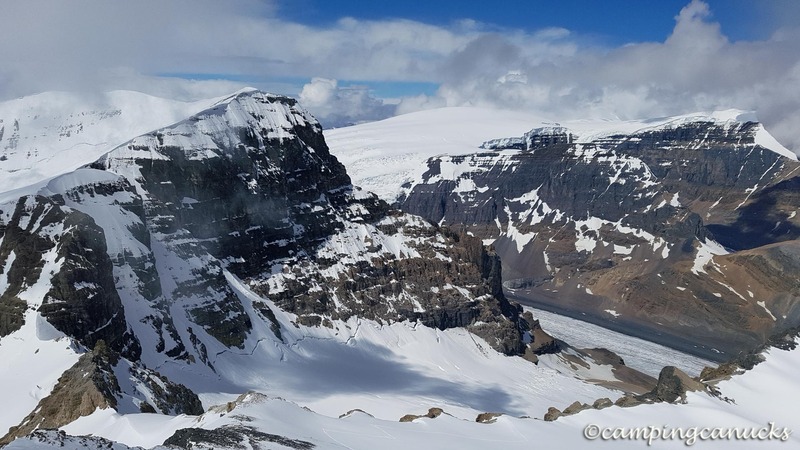 As it turned out though, from another lookout point, we could see there was in fact a group of people in the crevasse doing what appeared to be crevasse rescue training. That made us breathe much easier so we carried on back down to the parking lot and back to camp for the night. Now that we had a clearer idea of where the trail started, we planned to get up at 4am the next morning and make an attempt at the summit. We spent that evening getting everything ready and doing our best to get to sleep at a reasonable time, which was hard to do when the sun doesn’t set until after 10pm at that time of year. I can’t say getting up at 4am is one of my favourite things to do, especially when it’s gloomy and raining, but we got ourselves up, ate a quick breakfast and drove to the parking lot, where we met another group heading for Mount Andromeda that day. All of us commiserated about the rain but we all headed out anyway, hoping things would clear up for us later in the morning. And luckily for all of us, it did start to clear off and by the time we were approaching the headwall, the sun was rising and it was looking to be a fine day to go for the top. We made good time on the trail and found ourselves looking at the AA Col with just a hint of fresh snow from the previous day’s storm. 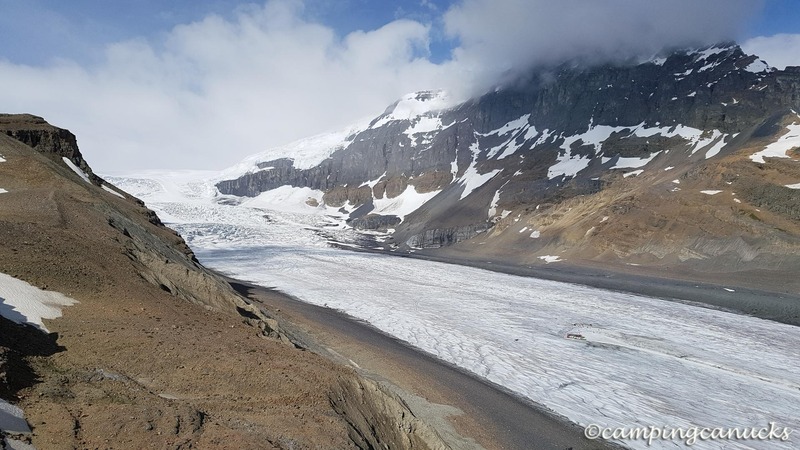 As we approached the glacier near the base of the col, we could see some small slide activity on the slopes so we knew some extra caution was going to be needed on the way up. We rested briefly and roped up at this time and started on our way across the glacier. We knew where the bergschrund (crevasse at the top of the glacier) would be but found that it was still under quite a bit of snow so we had no problem getting across. Now the first tough part of our climb began as we started up the slope. The snow was a mix of firm hard stuff and softer snow that we found ourselves post holing in up to our hips at times. Needless to say, it was quite tiring working our way up to the ridge above. It was with relief when we reached the top of the col, where we took a bit of a break to enjoy some lunch in the nice summer sunshine before we made our way up onto Silverhorn. The climb to Silverhorn was quite a bit easier due to the snow being a lot firmer from the wind and the colder temperatures. It might have been a sunny summer day but up on the mountain, it was only a few degrees above zero, which did work to our favour. There was a bit more cloud moving in as it got later in the day but fortunately for us, the clouds just kept going around us and the nearby mountains for the most part. Being now at the top of Silverhorn with our goal in sight, we really didn’t want to get fogged in or have another snow storm roll in while we were so exposed. We would have retreated if necessary but whiteout conditions would not have been fun at this point. From Silverhorn, it’s only about half a kilometer to the summit of Athabasca and we could see at this time vague steps in the snow from a group who had been up a couple of days before us. 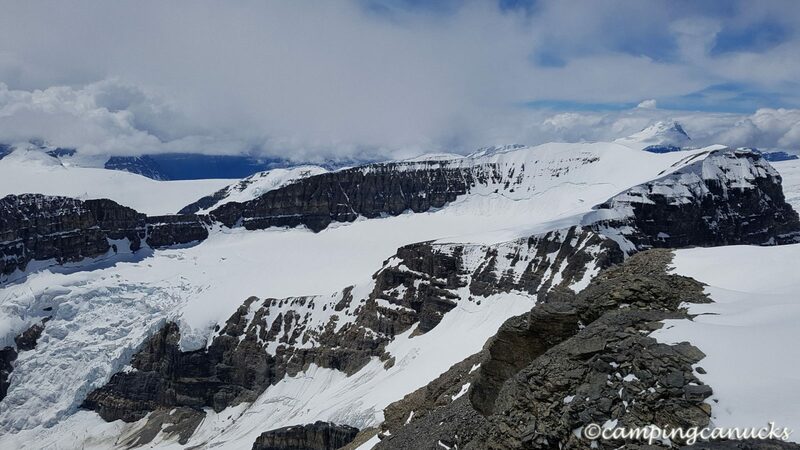 As the tracks in the snow seemed to be taking the best route along the ridge between the summits, we followed them to the top of Athabasca. We arrived at the summit tired but in good spirits, where we found a nice spot to have a break and sit a spell. We were amazed that there was practically no wind blowing at the top and that we had mostly clear visibility of the area around us. We couldn’t wipe the smiles off our of faces as we sat at the top of the mountain. Granted we still had a long trip down before we could call the trip a success but we were in high spirits at getting to the top safely. We knew we couldn’t linger long so we grabbed some more pictures after eating some snacks and began the trip back down. By this time, we noticed the snow had gotten a lot softer so we did find that we were sinking a lot more as we made our way down, but we still made good time coming down from Athabasca and Silverhorn. 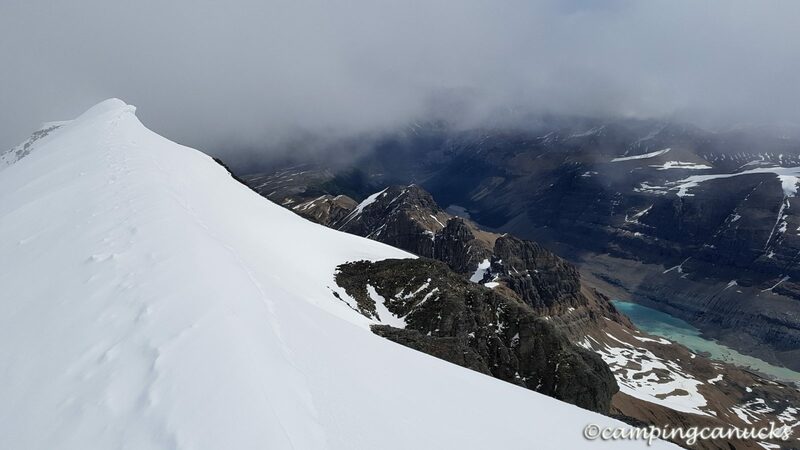 Once we reached the top of the col, we found that the snow had gotten very soft and with almost every step on the way down, we were sinking right to the ground. It was a grind going down the slope back to the glacier and we constantly had to be careful not to topple forward and fall. We tried going down backwards on some sections but it didn’t seem to make things any easier. 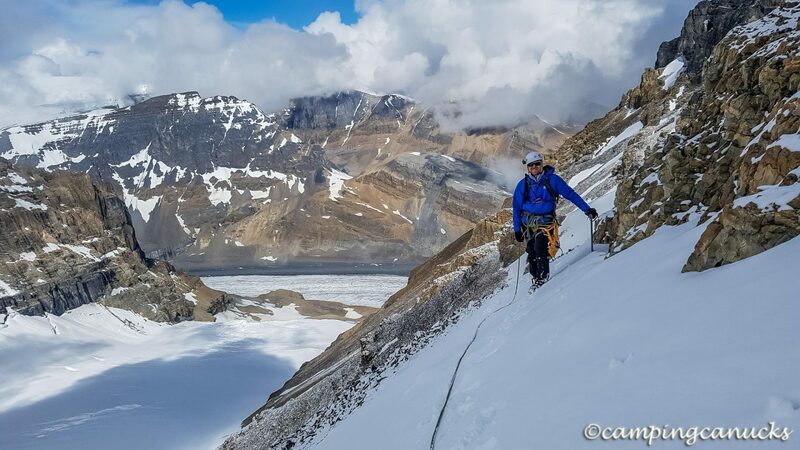 On our way down, we saw the climbers who had headed for Mount Andromeda far below us crossing the glacier. That did work out a bit in our favour as we were able to follow their tracks through the snow back to the headwall and let them do the post holing for us! Once past the headwall, we were out of the snow and back into the rocks. But being tired, we did find that we were stumbling now and again since much of the trail in the rocks is not firmly packed but has a lot of loose material on it. We got a good laugh a few times imagining ourselves slipping down the trail while the bus passengers below watched us. That was a show we didn’t want to give them. With a final slog down the last kilometers along the road, we found ourselves back at our vehicle and ready to head back to camp. We could consider the trip a success! 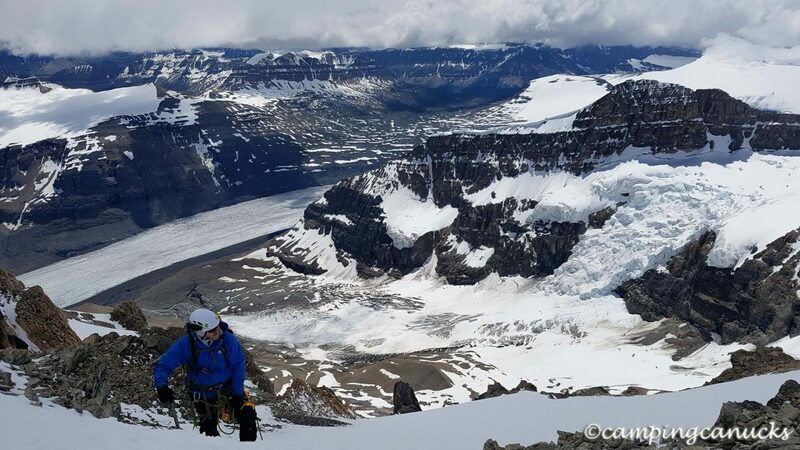 Mount Athabasca is an experience that neither of us will forget, being that it was our first ‘real’ mountaineering experience and we very much look forward to doing more mountaineering trips in the future. Anthony’s video of our trip on YouTube.